So last month, I invited him to do a guest post on my blog and today I’m really excited to say that he’s here with a Filipino recipe! Read on to find out what Raymund have in store for us, and don’t forget to visit him at his blog, his Facebook, Pinterest and Twitter! Hi everyone its Raymund here at Ang Sarap. Serval weeks ago I was invited by Jasline to do a Guest Post here and without hesitation I said yes even at this busy Christmas season. It is my pleasure and I am honoured to be invited in Guest Posts like this specially from a blogger I follow and I know delivers amazing dishes specially her desserts and baked goodies. I was requested to post a traditional Filipino dish, at first I thought it would be easy until suddenly I realized that after nearly five years of blogging of mostly Filipino dishes this would be a challenge. I think I had posted most of the Filipino recipes so I reviewed and checked what is still missing, then alas! I found one and it’s a Filipino favourite, the Sinigang. Sinigang basically is a soup dish where meats like pork, beef, fish, etc. are cooked with taro, kangkong (water spinach), okra and other vegetables in broth infused with tamarind. It’s one of the most common and favourite dishes in the Philippines and there are lots of variations depending on the region the dish. The most popular meat used in this dish is pork as it’s the cheapest alternative compared to beef or fish. 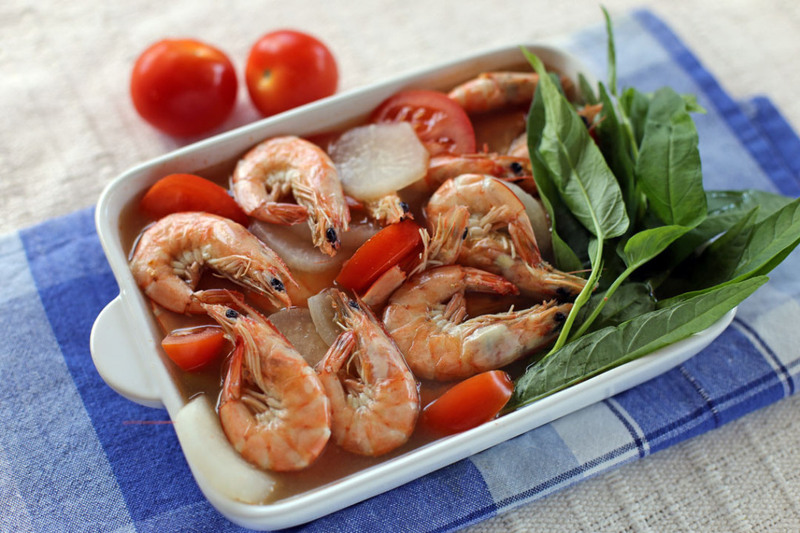 Prawns on the other hand is less popular not because people don’t like it but because prawns are very expensive back home hence this sinigang version is usually served only on special occasions. Eating the dish is also a bit different compared to other sinigang’s as it is enjoyed without using any utensils, yes you had seen it right “no utensils” which means we eat it by hand. That’s why if you notice the shrimps used in this dish are unshelled, using a fork and/or spoon is irrelevant as you will definitely use your hands in removing those shells. Another unusual way to enjoy this dish is to get all that juices from the shrimp’s head either by sucking or by squeezing them directly to the rice, I know for some it might sound disgusting but that’s a common thing to do. 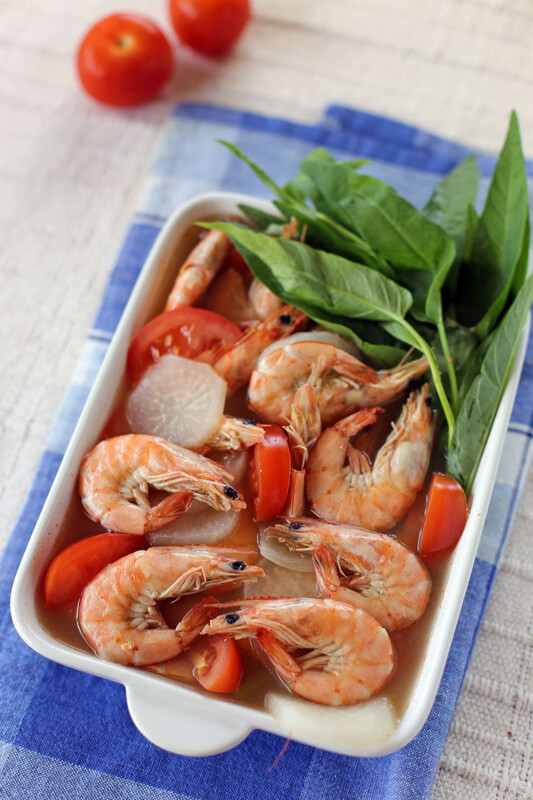 Sinigang, specially the shrimp version is one of those dishes that brings back a lot of memories, I remember eating this dish way back in the Philippines where the table is full of friends and families eating the same thing using their hands and sharing stories with each other’s while laughing and enjoying a simple meal. That’s the same thing that happened last night when we had this for dinner, I might have a small family now but just the smile on that lips and the stories and jokes that are passed around the table while enjoying this dish is simply irreplaceable. I know eating by your hands might sound weird but you have to try it at least once in your life to feel the freedom of eating bare handed. If using Tamarind pulp, separate the 2 cups of water from the 1 litre. Boil this together with the tamarind pulp until pulp is loose and melted. Strain the liquid to extract the juice then set this aside. Continue to next step if not using Tamarind Pulp. In a pot add onions, chillies, tomatoes and radish then pour water. Bring to a boil. Once boiling add shrimps and tamarind mix (if using), simmer for 5 minutes. Add spinach leaves then simmer for 2 more minutes. Season with fish sauce and freshly ground black pepper. Nice to meet you Jasline!! You chose a wonderful guest, and as always, Raymund pleases the readers with a succulent recipe. I love Raymunds website.. it’s been too long since I’ve visited there, so it’s great to see him here! Fantastic dish, such a beautiful presentation and great flavours!! Simply damn delicious tangy tamarind shrimp stew!!! This sounds absolutely delicious ! I love tamarind dishes and this is definitely going to be tried in my household soon. Thanks for this wonderful opportunity to guest post on your blog! Looks amazing! Definitely a dish my hubby and I would enjoy!